We acknowledge the traditional owners and occupiers of the land where we are now gathered, (the N. people ) and recognise that it continues to be sacred to them. God, from the womb you have formed us as your servant. Jesus, have mercy. God, you are our strength in time of failure and sin. Christ, have mercy. God, you send us to reveal your light and liberation to all people. Jesus, have mercy. Christ Jesus, you are the heart of every race and nation: Jesus, have mercy. Christ Jesus, you are the Lord of the powerful and influential: Christ, have mercy. Christ Jesus, you are the strength of the fragile and forgotten: Jesus, have mercy. by your abundant love and care. so that they may reveal your light and peace to the world. Introduction: In the womb we were formed and chosen to be God’s servants in this world. Let us pray that we may strengthened by God’s Spirit to witness to Christ’s presence by our striving to be God’s heart and peace in our world. The response: We come to do you will. For people especially in Iraq, Syria, the Philippines, the USA [add any other areas of conflict] whose lives are broken by war and conflict, for those who have been bereaved, maimed and displaced: may they be in our hearts, minds and actions for peace. Let us pray: We come to do you will. For people who have been victims of recent violence in South Sudan, Turkey, Egypt, Iraq, Syria, Afghanistan and Pakistan that all parties will come to see the connection we all share with one another: may they find hope within the darkness that they are not forgotten. Let us pray: We come to do you will. For organisations around the world that work to bring reconciliation, healing, dialogue and understanding between peoples and nations: may they never be overcome by the enormity of their work but remember that this work is long and frustrating. Let us pray: We come to do you will. For Indigenous Australians who continue seek healing as members of the stolen generations, who seek justice for land stolen and wages unpaid: may they fully accepted and treated with full equality and equity in every way in this nation. Let us pray: We come to do you will. As we remember the life and work and death of Dr. Martin Luther King, Jr., may God call prophets today who struggle against racism, stand against all unjust discrimination, and seek to overturn all forms of injustice locally and globally. Let us pray: We come to do you will. 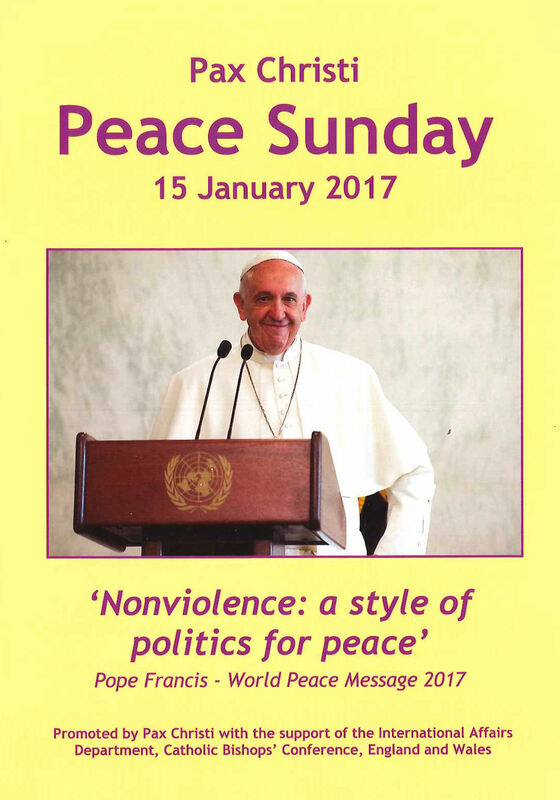 For our families, parish and social communities that they be places of peace and acceptance of all members. Let us pray: We come to do you will. For people who work in the media: may they be aware of their responsibilities to bear the truth to their people by opening our eyes to injustices as well as the good news of peoples’ effects to create and alternative world. Let us pray: We come to do you will. We pray with hope and promise for our nation at the beginning of this year; may we be mindful of our responsibilities to all peoples within our borders and those who live beyond, especially those in the Asia-Pacific region. Let us pray: We come to do you will. We pray for the often forgotten peoples of Africa especially those affected by communal conflict and violence, foreign interference by European nations, China and the USA, the many people who continue to live with many treatable diseases and poverty: may we all be mindful of our connectedness and that their problems are also our problems. Let us pray: We come to do you will. Concluding Prayer: God of all peoples, hear our prayers and the prayers of people everywhere. Make us know that we are bound together in the name of Jesus, your Son, who is Lord and servant. and continue the work of his liberation by our self-giving. and been nourished by Jesus who becomes bread for us. and be his peace and his love in our world. 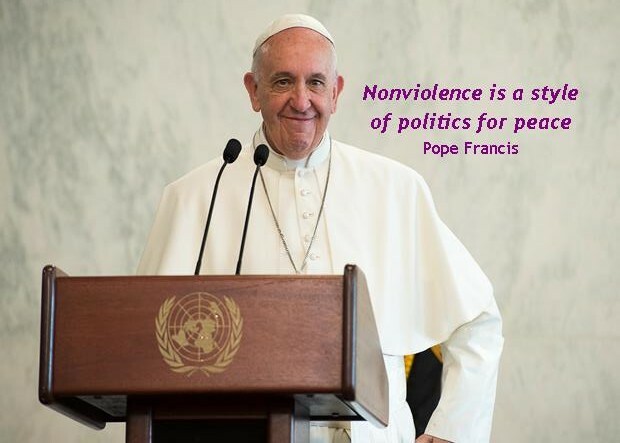 “…’piecemeal’ violence, of different kinds and levels, causes great suffering: wars in different countries and continents; terrorism, organized crime and unforeseen acts of violence; the abuses suffered by migrants and victims of human trafficking; and the devastation of the environment. Where does this lead? Can violence achieve any goal of lasting value? Or does it merely lead to retaliation and a cycle of deadly conflicts that benefit only a few “warlords”? To transform your earth through prayer and action. Bless each of us in the days ahead. Bless our efforts to serve the poor and the disadvantages. The way we are cutting taxes for the wealthy and social programs for the poor, you'd think the greedy were needy and the needy were greedy. Each of us is called to be the heart and the face of Jesus, Lamb of God, offered in sacrifice. We are called to be prepared to give our lives in love and union with our crucified and risen Jesus and in the company of so many who have given their lives before us, or are suffering crucifixion today. And if today we cannot drink all together from the same chalice of the blood of Christ, let us drink together from the chalice of suffering: the suffering of division, the division among ourselves, and the division with the poor and the suffering. Let us renew then with greater humility our total trust in Jesus, life of the world. Christ is not only a healer of individuals. He is also a prophet to the nations. While he walked the earth, Jesus delivered people from paralysis, insanity, leprosy, suppurating wounds, deformity, and muteness. But again and again in word and deed he returned to the plight of the poor, whose poverty, in true prophetic fashion, he considered no historical accident, but the fruit of social injustice. What would he say and do in our hard and uncertain times, in a world of thirteen million refugees, a world one-half of whose children never as much as open their mouths to say 'aah' to a doctor, a world in which almost every country is robbing the poor to feed the military? And would he not pronounce our own nation a greedy disgrace? Whole cities could live on the garbage from our dumps, on the luxuries we consider necessities. The world with its triumphs and despairs, its beauty and ugliness, has today moved next door to every one of us. Only spiritual deafness can prevent our hearing the voice of God in the clamor of the cities. Only blindness of a willful sort can prevent our seeing the face of the Risen Lord in the faces of the suffering poor. The glory of God is the human race fully alive, and that means at least minimally fed, clothed and housed. The primary problems of the planet arise not from the poor, for whom education is the answer; they arise from the well-educated, for whom self-interest is the problem. Courage means being well aware of the worst that can happen, being scared almost to death, and then doing the right thing anyhow. Knowledge emerges only through invention and re-invention, through the restless, impatient, continuing, hopeful inquiry [people] pursue in the world, with the world, and with each other. for each of them is conducting a great struggle. A religion which ends with the individual, ends. If evangelicals believe that God cares about the fate of a fetus, it shouldn't require a huge leap in logic to surmise that God cares about people of colour or prisoners or immigrants or those with an orientation other than heterosexual. Too often I looked at being relevant, popular, and powerful as ingredients of an effective ministry. The truth, however, is that these are not vocations but temptations. Jesus asks, ‘Do you love me?’ Jesus sends us out to be shepherds, and Jesus promises a life in which we increasingly have to stretch out our hands and be led to places where we would rather not go. He asks us to move from a concern for relevance to a life of prayer, from worries about popularity to communal and mutual ministry, and from a leadership built on power to a leadership in which we critically discern where God is leading us and our people. ‘Each of us is called to be the heart and the face of Jesus, Lamb of God, offered in sacrifice. We are called to be prepared to give our lives in love and union with our crucified and risen Jesus and in the company of so many who have given their lives before us, or are suffering crucifixion today. Contemporary atonement ideas have succeeded primarily in turning God into a child-abusing heavenly parent. They have also turned Jesus into being the ultimate, perhaps even the masochistic, victim of a sadistic father God. To sin by silence when we should protest makes cowards out of (men). Worse than apathy is defeatism. The defeatist recognizes the problem that the apathetic person doesn't see, yet has convinced himself that there is nothing he can do and therefore washes his hands of all responsibility. The intellectual's role generally is to uncover and elucidate the contest, to challenge and defeat both an imposed silence and the normalized quiet of unseen power, wherever and whenever possible. Parties to a conflict shall insure the burial or cremation of the dead, carried out individually as far as circumstances permit, is preceded by a careful examination...of the bodies with a view to confirming death, establishing identity. We don’t do body counts. If the Church is in need of continual reform she is in need of continual criticism. John Hay 1838-1905 American statesman, diplomat, author, journalist, personal secretary to Abraham Lincoln. One of the shrewdest ways for human predators to conquer their stronger victims is to steadily convince them with propaganda that they're still free. N.A. Scott, American author, intellectual, anti-totalitarian figure. The question is not whether the things that happen to you are chance things or God’s things because, of course, they are both at once. There is no chance thing through which God cannot speak—even the walk from the house to the garage that you have walked ten thousand times before, even the moments when you cannot believe there is a God who speaks at all anywhere. He speaks, I believe, and the words he speaks are incarnate in the flesh and blood of ourselves and of our own footsore and sacred journeys. We cannot live our lives constantly looking back, listening back, lest we be turned to pillars of longing and regret, but to live without listening at all is to live deaf to the fullness of the music. Sometimes we avoid listening for fear of what we may hear, sometimes for fear that we may hear nothing at all but the empty rattle of our own feet on the pavement. But be not affeard, says Caliban, nor is he the only one to say it. ‘Be not afraid,’ says another, ‘for lo, I am with you always, even unto the end of the world.’ He says he is with us on our journeys. He says he has been with us since each of our journeys began. Listen for him. Listen for the sweet and bitter airs of your present and your past for the sound of him. Frederick Buechner, The Sacred Journey (San Francisco: Harper and Row, 1982). The whole aim of practical politics is to keep the populace alarmed -- and thus clamorous to be led to safety -- by menacing it with an endless series of hobgoblins, all of them imaginary. People who think of government as the institution to entrust with enough power to right all the world's wrongs seem to never consider that they must thereby give it enough power to do wrong to all the world's rights. In fact, they seem NEVER to consider what the founders always thought was obvious: that the 'good guys' will NOT always be in charge! The only limit to the oppression of government is the power with which the people show themselves capable of opposing it. Place me not with those who are weak of mind and willingly give up the rights of others, for these poor ignorant souls know not that the rights they give up are their own! DO NOT KEEP SILENT when your own ideas and values are being attacked. ...If a dictatorship ever comes to this country, it will be by the default of those who keep silent. We are still free enough to speak. Do we have time? No one can tell. My greatest fear is that too many members of the public will embrace the government's call to give up some freedom in return for greater safety, only to find that they have lost freedom without gaining safety. The point to remember is that what the government gives, it must first take away. Liberty and Justice go hand in hand. You can't have one with out the other. The more restrictions that you place on Liberty, the more injustice you will receive. I don't believe in predestined fate. The future is what we choose to create. Whenever the legislators endeavour to take away and destroy the property of the people, or to reduce them to slavery under arbitrary power, they put themselves into a state of war with the people, who are thereupon absolved from any further obedience. help us to honour and claim our identity in you. You above all others know us best. embodying you as we are without guilt, shame or blame. know that you are as near to us as our next breath. There have been a series of showings in the readings in recent weeks from the stable, the epiphany, the baptism of Jesus. In all we are being asked: what do you see? who do you see? Though the gospels begin at the baptism at the river, each offers a very different picture of John and Jesus, of what happened and what followed later. It is normal for people to experience the same event differently – and indeed, to experience, God differently. Today’s gospel presents Jesus’ baptism as an acclamation: ‘Here is the Lamb of God!’ And John says, All my work has been for this, that he may be seen! And, I saw the Dove descend on him at his baptism (it is a past event), and then again, ‘Look, here comes the Lamb of God!’ Jesus is acclaimed by John as the man to watch, to get to know, to hear and see. Today’s readings in the Catholic liturgy leave out Isaiah 49:4 which changes the meaning of the message. The writer is bearing his soul but his sense of failure is omitted. He feels he has toiled for nothing yet proclaims that though living in the darkness and the hopelessness of exile he can imagine a new reality. Though he feels abandoned by the people he does not feel abandoned by God. Today is Martin Luther King, Jr. day in the US. When he emerged from the milling crowd (as did Jesus by the river) around Rosa Parks, he stepped up as a teacher to a people groaning and straining in a river of dark dreams. Rosa Parks had worked for such a moment for years. She had laid the groundwork by refusing to stand up for a white person on a bus. King came and brought his particular blessing, his ability to speak with a voice that brought together a vast array of people looking for light and liberation. Like John in baptising Jesus, we could say that in some way Rosa Parks ‘baptised King into his powerful service among a people who had also been displaced and in exile in their own country. She was his forerunner, and that he was the one for whom she had been waiting. But there is a hint of failure which no follower of God escapes - not Jesus, not John the Baptist, not Paul, not Martin Luther King and not Oscar Romero. And neither shall we. One once lamented: ‘I love my enemy and he (or she) does not change. I give to the poor and there are more poor. I try to change my behaviour, and another destructive one emerges. I strive to make a difference and nothing seems to happen.’ But, instead of letting us mope and fret over our failures, God constantly points us further down the road, to those doors that have opened far beyond the closed doors we already passed. Is it okay that 3 billion people live on less than $2 a day and more than one billion live on less than $1 a day? Is it acceptable that the life expectancy of Australian Aborigines is 17 years less than others in the population? Is it acceptable that children, women and men who have sought protection continue to be treated as criminals and detained for months or years that add to their already traumatised lives? Is it acceptable that we call our prevention of asylum seekers coming to our country a matter of ‘war’, or border security? Is it acceptable that we continue to tell untruths about the arrival of people who seek security and a decent life? Is it acceptable that 30,000 children die each day from preventable poverty and disease? Is it acceptable that we build armaments and better ways of killing yet spend less and less on peoples’ wellbeing, health and education? Is it acceptable that those who seek to find the truth and tell the truth about injustice be accused and treated as traitors? Is it acceptable that we continue to keep averting our gaze from the plight of our sisters or brothers or justify inaction by blaming them for their situation? For many people the walls of division and inequity are intolerable. They do not turn to the sports channel or the sports page to avoid what God is saying to us about what is intolerable and unjust in our world. Something gets their attention. Their hearts are touched by what they see and they are hooked. They cannot look away as their hearts break open and let the world in. Jim Wallis also said that as well as revising what is unacceptable, we need to see what is possible. This requires following the tugs of conscience, making our voices and words sharper and clearer, listening to the language of the heart and humanity rather than the language of so-called ‘respectable’ economic or political forces. (WikiLeaks has already shown us how ‘respectable’ they are.) It requires asking how we can change them. Like the Hebrew exiles, many people believe that change is not possible. They become cynical; lose hope; and go into survival mode and look after number one. Christians today can find the institutional church hard-hearted to Jesus' message of acceptance and welcome, of nonviolence and love, of breaking down barriers. Not unlike the experience of the early community as it searched for truth and justice, it discovered the Spirit present in its midst. In our communities we need to return to the sources so that we do not succumb to the values, methods and ways of doing things of the dominant culture. John’s community was in danger of creeping authoritarianism and threatened to betray Jesus’ vision of community based on the presence of the Spirit. Despite a deep sense of failure, Isaiah discovered in his call a need to revise his sights. They had been set too low and he needed to focus not only on his community but on the wider world. He discovered that his call was to reveal God’s light and peace to all peoples. One significant shift that needs to be made in the world is for every person and organisation to recognise their part (their calling) in addressing the great challenges we face, and to embrace the necessary sacrifices required to bring about justice. This involves wealthy nations making such changes as doing away with trade restrictions and unjust trade subsidies and requirements in order to level the playing field for poorer, less powerful nations. It involve refusing to use sweat shops, and doing the necessary checks to ensure that producers of the products we import and sell are treating their workers fairly. It means cancelling third world debt, and prioritising health care and getting medicine to those who need it over the profits that can be made through these medicines. It means, for those who live in poorer countries, addressing the corruption and lack of accountability that sometimes plagues aid in these countries. It will not be without significant commitment and sacrifice. As we work for these changes, we may be mocked and threatened, labelled and rejected. But, ultimately, as the world’s systems change, so God’s reign is manifest, and God’s life is made available to all. We too need to look beyond the moment and the neighborhood. The darkness that Isaiah felt was not unlike the powerlessness many people have felt at and following the various UN climate conferences in Copenhagen, Cancun, Doha, Warsaw and more recently in Paris, and the many who continue to try to confront many ecological, political, or economic crises. They found hope by taking action. We are also reminded these days that God chose to be revealed to all nations. While we may not be able do too much alone, joined with others, we can inspire new values and behaviors that can bring life to the world. Though our efforts may seem fruitless, or falling short of God’s call, God is still working in our lives and the lives of others; God’s presence still calls us to responsibility and ownership of our actions. Answering Jesus call to follow is a daily decision. It might entail decisions about our consumptions, what and how we buy, what we drive, where we live, what we eat, how we use energy, how we work, how we treat others and how we care for ourselves. These decisions can result in sacrifices we would rather avoid. The call of Pope Francis has been to remind us that discipleship is about recognising that our faith is about our interconnectedness with all creation and with each other. Faith is not an individual journey, but connects us to community. Our faith brings us face to face with others, and our choices and lifestyles impact on others. God so often acts outside of our perceived boundaries and our interaction with other religions should acknowledge that God can choose who and how God will be made known. The gospel challenges us to take a fresh look at our attitude towards people of other religions without losing our understanding and experience of the uniqueness of Christ. We live in a fragile world and we are in it together. We are interconnected – even we do not always admit it. What we do affects others and vice versa. As Jesus lived out his call, he manifested God’s borderless love, mercy and compassion. They knew no boundaries. Isaiah attests that God desires ‘life’ and peace for all peoples and nations. Along with the servant in the first readings, Jesus shared the awareness that his call had a wider scope than originally anticipated as he brought God’s tender love and compassionate care to the outcasts, the unclean and the Gentiles. ‘It is futile for earthbound humanity to still cling to the dark and poisoning superstition that its world is bounded by the nearest hill, its universe ended at the river shore, its common humanity enclosed in the tight circle of those who share its town and views and the colour of its skin. It is the task of our educators and of young people to strip the last remnants of that ancient, cruel belief from the civilisation of humankind’. At the beginning of this year, let us strive so that others will see God’s love made flesh in and through our lives - ordinary women and men who are simply being truly human or as the Africans say, displaying ‘ubuntu’ – that I am human through you and you are human through me. It requires courage. As William Sloan Coffin said, ‘Courage means being well aware of the worst that can happen, being scared almost to death, and then doing the right thing anyhow’ [William Sloane Coffin in Credo]. Even when stuck in the mud of despair and waiting for justice to be established, we can still have a song of hope in our hearts and in our mouths. And haven’t the people of the Philippines evidenced that following numerous devastating typhoons, ongoing oppression by the military and corruption in government. In the difficult moments, there are still gifts to embrace and celebrate.